Get free shipping at Old Navy when you spend $50 or more through Saturday, August, 14, 2010 at 11:59 p.m. EST. Use Old Navy coupon code ONSHIP50. One-time use only. Standard shipping is usually $7, so if you spend exactly $50 this amounts to a savings of 14% off. If you put things from Gap, Banana Republic, Piperlime, or Athleta in your cart, it does not count towards the $50 -- believe me, I tried. But you can get 20% off kids purchases at Old Navy, PiperlineKids, and Gap, excluding GapKids jeans. Use coupon code KIDS20, which expires August 11, 2010. Online only. Not sure if the coupon code is case sensitive. And right now Gap jeans are $20 off, no coupon code needed. Unclear when the jeans sale ends. 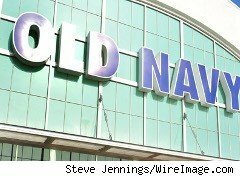 Caveats to Old Navy coupon code: valid on U.S. shipments using standard shipping only. Discount applies to merchandise, not gift cards, packaging, taxes or shipping & handling. No adjustments on previous purchases. Cannot be combined with other offers or discounts, including Gap Inc. employee discount. Offer is non-transferable without consent from Gap Inc.